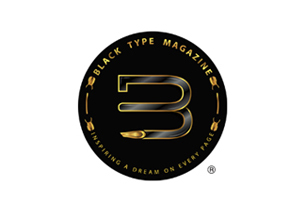 J. Tyler and J. Patterson are starting a brand new magazine publication called "Black Type". This magazine will promote and connect up and coming artist with a world of readers. The magazine is a tool to encourage and inspire readers to pursue their dreams and passions. Black Type is a term associated with horse races. Horses that appear in black bold type, within catalogs, are known to be of the highest caliber and race at the highest levels. The creators wanted to express that those featured in their magazine is of this level. Both Patterson and Tyler wanted the logo to be geared toward passionate college level youth mainly of African/ African-American background. Given the African base, the influences relayed by both men were of Egyptian aesthetics...(for ex. Sphinx, Pyramids of Giza Etc). This concept borrows its style from the very first writing tool in existence, the reed “pen”. This tool was invented in Egypt used along with Papyrus to tell stories through symbols. This theme ties the personality of Black Type with Afro-Centrism, the arts, nostalgia, and sophistication. It also ties in well with the target audience, being passionate youth figuring out their lives. What better way to lead such a group than with a tool that represents pioneering innovation and creativity. The pen wraps around and forms a solid “B” to strongly represent the “Black” in Black Type. The mark is also accented with 4 scarab beetles. "The scarab beetle was a symbol of great power in Egyptian mythology. It was said that it pushed the sun into the sky at the dawn of each day"...In this way the beetle became the Egyptian symbol for rebirth, the ability to be reborn.